"Airtanker" redirects here. For the British air-to-air refuelling project, see AirTanker Services. Depending on the size, location, and assessed potential of the wildfire, the "air attack" or ATGS person may be charged with initial attack (the first response of firefighting assets on fire suppression), or with extended attack, the ongoing response to and management of a major wildfire requiring additional resources including engines, ground crews, and other aviation personnel and aircraft needed to control the fire and establish control lines or firelines ahead of the wildfire. A wide variety of helicopters and fixed-wing aircraft are used for aerial firefighting. In 2003, it was reported that "The U.S. Forest Service and Bureau of Land Management own, lease, or contract for nearly 1,000 aircraft each fire season, with annual expenditures in excess of US$250 million in recent years". Helicopters may be fitted with tanks (helitankers) or they may carry buckets. Some helitankers, such as the Erickson AirCrane, are also outfitted with a front-mounted foam cannon. Buckets are usually filled by submerging or dipping them in lakes, rivers, reservoirs, or portable tanks. The most popular of the buckets is the flexible Bambi Bucket. Tanks can be filled on the ground (by water tenders or truck-mounted systems) or water can be siphoned from lakes, rivers, reservoirs, or a portable tank through a hanging snorkel. 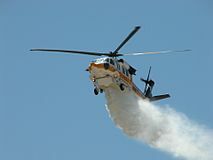 Popular firefighting helicopters include variants of the Bell 204, Bell 205, Bell 212, Boeing Vertol 107, Boeing Vertol 234 and the Sikorsky S-64 Aircrane helitanker, which features a snorkel for filling from a natural or man-made water source while in hover. Currently the world's largest helicopter, the Mil Mi-26, uses a Bambi bucket. 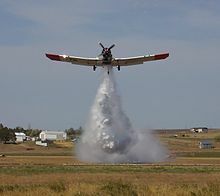 A PZL M-18 Dromader drops water near Mobridge, South Dakota in the US. An Ilyushin Il-76TD of Iran's Islamic Revolutionary Guard Corps demonstrates aerial firefighting at an air show. An Antonov An-32 of the State Emergency Service of Ukraine dumps water on a forest fire. Airtankers or water bombers are fixed-wing aircraft fitted with tanks that can be filled on the ground at an air tanker base or, in the case of flying boats and amphibious aircraft, by skimming water from lakes, reservoirs, or large rivers. Various aircraft have been used over the years for firefighting. In 1947, the United States Air Force and United States Forest Service experimented with military aircraft dropping water-filled bombs. The bombs were unsuccessful, and the use of internal water tanks was adopted instead. Though World War II- and Korean War-era bombers were for a long time the mainstay of the aerial firefighting fleet, newer purpose-built tankers have since come online. The smallest are the Single Engine Air Tankers (SEATs). These are agricultural sprayers that generally drop about 800 US gallons (3,000 l) of water or retardant. Examples include the Air Tractor AT-802, which can deliver around 800 US gallons (3,000 l) of water or fire retardant solution in each drop, and the Soviet Antonov An-2 biplane. Both of these aircraft can be fitted with floats that scoop water from the surface of a body of water. 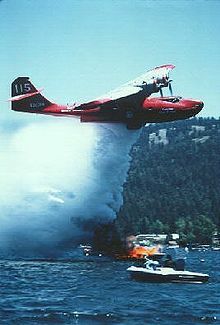 Similar in configuration to the World War II–era Consolidated PBY Catalina, the Canadair CL-215 and its derivative the CL-415 are designed and built specifically for firefighting. The Croatian Air Force uses six CL-415s as well as six AT 802s for firefighting purposes. 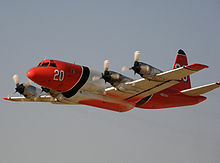 Medium-sized modified aircraft include the Grumman S-2 Tracker (retrofitted with turboprop engines as the S-2T) as used by the California Department of Forestry & Fire Protection, as well as the Conair Firecat version developed and used by Conair Group Inc. of Canada, while the Douglas DC-4, the Douglas DC-7, the Lockheed C-130 Hercules, the Lockheed P-2 Neptune, and the Lockheed P-3 Orion – and its commercial equivalent, the L-188 Electra – have been used as air tankers. Conair also converted a number of Convair 580 and Fokker F27 Friendship turboprop airliners to air tankers. The largest aerial firefighter ever used is a Boeing 747 aerial firefighter, known as the Global Supertanker, that can carry 19,600 US gallons (74,200 l) fed by a pressurized drop system. The Supertanker was deployed operationally for the first time in 2009, fighting a fire in Spain. The tanker made its first American operation on August 31, 2009 at the Oak Glen Fire. It has since been replaced by a Boeing 747-400. Another wide body jetliner that is currently being used as an air tanker is the modified McDonnell Douglas DC-10 operated by the 10 Tanker Air Carrier company as the DC-10 Air Tanker. It can carry up to 12,000 US gallons (45,400 l) of fire fighting retardant. The Russian Ministry of Emergency Situations operates convertible-to-cargo Ilyushin Il-76 airtankers that have been operating with 11,000-US-gallon (41,600 l) tanking systems, and several Beriev Be-200 jet powered amphibians. The Be-200 can carry a maximum payload of about 12,000 litres (3,200 US gal) of water, making "scoops" in suitable stretches of water in 14 seconds. Bombardier's Dash 8 Q Series aircraft are the basis of new, next-generation air tankers. Cascade Aerospace has converted two pre-owned Q400s to act as part-time water bomber and part-time transport aircraft for France's Sécurité Civile, while Neptune Aviation is converting a pre-owned Q300 as a prototype to augment its Lockheed P-2 Neptune aircraft. The Sécurité Civile also operates twelve Canadair CL-415 and nine Conair Turbo Firecat aircraft. Neptune Aviation also currently operates converted British Aerospace 146 jetliners as air tankers. The BAe 146 can carry up to 3,000 gallons of fire fighting retardant. Air Spray USA Ltd. of Chico, California has also converted the BAe 146 jetliner to the role of air tanker. Another modern-era passenger aircraft that has now been converted for aerial firefighting missions in the U.S. is the McDonnell Douglas MD-87 jetliner. The MD-87 can carry up to 4,000 gallons of fire fighting retardant. Coulson Aviation unveiled the future of aerial fire fighting with the Boeing 737-300 in May 2017. Six aircraft have been purchased from Southwest Airlines for the RADS system conversion which is set to enter service in December 2017. The 737 aircraft is smaller than the C-130Q which allows for a wider range of airfields to be utilized. Britt Coulson further explained the aircraft will be able to retain the current seat and galley configuration for tanker operations. On 22 November 2018, the 737 was used for the first time to fight a fire new Newcastle, Australia. all links, citations and data sources are listed in the paragraph above. For accident and grounding citations, see paragraph below table. Category legend: Light: under 1,000 US gallons (3,800 L), Medium: under 10,000 US gallons (38,000 l), Heavy: under 20,000 US gallons (76,000 L), Super Heavy: Over 20,000 US gallons (76,000 L) - currently only used for the B747 Supertanker. Other former military aircraft utilized as firefighting air tankers in the U.S. in the past included the B-17 and the PB4Y-2, a version of the B-24. The Lead Plane function directs the activities of the airtankers by both verbal target descriptions and by physically leading the airtankers on the drop run. The leadplane is typically referred to as a "Bird Dog" in Canada or "Supervision" aircraft in Australia. The O-2 Skymaster, Cessna 310 and OV-10 Bronco have been used as spotter and lead plane platforms. The Ontario Ministry of Natural Resources has also used the Cessna 337. The Beechcraft Baron was long used as a leadplane or air attack ship, but most were retired in 2003; more common now is the Beechcraft King Air and the Twin Commander 690. A Cessna Citation 500 jet owned by Air Spray (1967) LTd. was used by the British Columbia Ministry of Forests beginning in 1995 and used for two fire seasons to lead the very fast Electra L188 air tanker to the fires. This was the first time a jet aircraft was used as a lead plane or "bird dog". The Department of Parks and Wildlife in Western Australia operates a fleet of nine American Champion Scouts 8GCBC during the summer months as spotter aircraft and Air Attack platforms. The Provinces of Alberta and British Columbia and the Yukon Territories contract to supply Twin Commander 690 as bird dog aircraft for their air tanker fleets. Air Spray owns 9 Twin Commander 690 for use as bird dog aircraft. In the United States, most of these aircraft are privately owned and contracted to government agencies, and the National Guard and the U.S. Marines also maintain fleets of firefighting aircraft. On May 10, 2004, The U.S. Forest Service (USFS) and the Bureau of Land Management (BLM) announced that they were cancelling contracts with operators of 33 heavy airtankers. They cited liability concerns and an inability to safely manage the fleet after the wing failure and resulting crash of a C-130A Hercules in California and a PB4Y-2 in Colorado during the summer of 2002. Both aged aircraft broke up in flight due to catastrophic fatigue cracks at the wing roots. After subsequent third-party examination and extensive testing of all USFS contracted heavy airtankers, three companies were awarded contracts and now maintain a combined fleet of 23 aircraft. Borate salts used in the past to fight wildfires have been found to sterilize the soil and be toxic to animals so are now prohibited. Newer retardants use ammonium sulfate or ammonium polyphosphate with attapulgite clay thickener or diammonium phosphate with a guar gum derivative thickener. These are not only less toxic but act as fertilizers to help the regrowth of plants after the fire. Fire retardants often contain wetting agents, preservatives and rust inhibitors and are colored red with ferric oxide or fugitive color to mark where they have been dropped. Brand names of fire retardants for aerial application include Fire-Trol and Phos-Chek. Some water-dropping aircraft carry tanks of a guar gum derivative to thicken the water and reduce runoff. Helicopters can hover over the fire and drop water or retardant. The S-64 Helitanker has microprocessor-controlled doors on its tank. The doors are controlled based on the area to be covered and wind conditions. Fixed-wing aircraft must make a pass and drop water or retardant like a bomber. Spotter (Air Tactical Group Supervisor) aircraft often orbit the fire at a higher altitude to coordinate the efforts of the smoke jumper, helicopter, media, and retardant-dropping aircraft; while lead planes fly low-level ahead of the airtankers to mark the trajectory for the drop, and ensure overall safety for both ground-based and aerial firefighters. Film showing Waterbombers from the California Air National Guard dropping substances used to fight fires. Water is usually dropped directly on flames because its effect is short-lived. Fire retardants are typically dropped ahead of the moving fire or along its edge and may remain effective for two or more days. This can create artificial firebreaks where the terrain is too rugged or remote for ground crews to cut fireline. Aerial firefighting is most effectively used in conjunction with ground-based efforts, as aircraft are only one weapon in the firefighting arsenal. However, there have been cases of aircraft extinguishing fires long before ground crews were able to reach them. July 22, 1960: a North American B-25 Mitchell, N3446G SN 44-31466, operating as Tanker 66, impacted the earth during a water bombing run in Mill Canyon in the San Gabriel Mountains on the Magic Mountain Fire. The three crew members were killed. August 13, 1994: a Lockheed C-130A, N135FF, operating as Tanker 82, impacted mountainous terrain near Pearblossom, California. All three crew members sustained fatal injuries. June 21, 1995: a Douglas C-54G, N4989P, operating as Tanker 19, and a Beech B58P, N156Z, operating as Lead 56 collided in mid air in Ramona, California. 2 crew members of Tanker 19 as well as the pilot of Lead 56 were killed in the collision. 2002 airtanker crashes: loss of Tanker 130 and Tanker 123. July 16, 2003: a Lockheed L188 Electra operated by Air Spray Ltd. struck the terrain on the side of a steep ridge while fighting a wildfire near Cranbrook BC. Two pilots were killed. July 31, 2010: a Convair CV580 operated by Conair Aviation crashed battling a wildfire near Vancouver BC. The two pilots were killed in the crash. May 21, 2011: a Bell 212 helicopter went down just offshore in Lesser Slave Lake, Alberta, killing the pilot. June 3, 2012: a Lockheed P2V-7, operating as Tanker 11, crashed into mountainous terrain while fighting a wildfire in Utah. The 2 pilots were killed in the crash. July 1, 2012: a Lockheed C-130 operated by the North Carolina Air National Guard's 145th Airlift Wing crashed in the Black Hills of South Dakota while supporting efforts to contain the White Draw Fire. Four airmen were killed, while two airmen survived the crash but sustained serious injuries. October 24, 2013: a modified PZL-Mielec M-18A Dromader, operated by Rebel Ag crashed after the left wing separated in flight while conducting waterbombing operations west of Ulladulla, New South Wales, killing the pilot. May 22, 2015: an Air Tractor 802F Fire Boss amphibious air tanker, operated by Conair Aviation crashed battling a wildfire near Cold Lake, Alberta, killing the pilot. July 10, 2015: an Air Tractor 802F Fire Boss amphibious air tanker, operated by Conair Aviation crashed and sank while scooping water from Puntzi Lake, British Columbia.The pilot was not injured. 17 August 2018: a BK117 owned by Sydney Helicopters crashed after hitting a tree while supporting operations on the Kingiman fire west of Ulladulla, New South Wales, Australia, with the pilot dying. 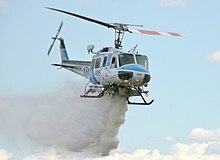 An urban legend arises sometimes about a water bomber, or a helicopter with a dangling water bucket, inadvertently scooping up a scuba diver and dumping him on a wildfire site. Urban legend debunking site Snopes.com reports there are no proven cases of this happening in reality. The CGI movie Planes: Fire & Rescue depicts aerial firefighting. The plot of Steven Spielberg's 1989 remake movie "Always" centers around aerial fire fighting. ^ "USDA Forest Service Wildland Fire Chemicals". Retrieved 2008-11-13. ^ "FindLaw's United States Ninth Circuit case and opinions". Retrieved 19 November 2016. ^ a b "Interagency Standards for Fire and Aviation Operations 2007, Chapter 17" (PDF). National Interagency Fire Center. Archived from the original (PDF) on 2007-09-28. Retrieved 2007-08-31. The popular media also frequently use the terms water bomber, fire bomber or borate bomber. 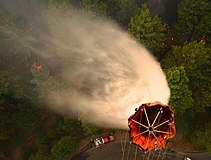 Helicopters often are used to drop retardant or water on a wildfire, whether they're functioning as helitankers (a heavy helicopter outfitted with a belly tank for dropping water or retardant on a fire), or medium- or light-weight helicopters equipped with buckets for smaller drops on fires). 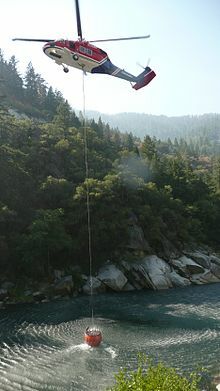 Some helicopters are used on fires for cargo (helitack) delivering supplies to firefighters, usually with netted cargo slung under a helicopter, and other helicopters are certified for and used for personnel transport -- ferrying wildland firefighters to remote locations where ground transport is either difficult or impossible. ^ "Wildfire Fighting: Provincial & Territorial Approaches to Air Tankers". Canadian American Strategic Review. May 2016. Archived from the original on 2016-06-11. ^ "Statement of Larry Hamilton National Director, Office of Fire and Aviation, Department of the Interior, Bureau of Land Management, National Interagency Fire Center Oversight Hearing: Blue Ribbon Panel Report and Aerial Firefighting Safety Senate Energy and Natural Resources Committee Subcommittee on Public Lands and Forests". March 26, 2003. Retrieved 2007-09-27. ^ "AT&T - Page Not Available". Retrieved 19 November 2016. ^ "Photos of Convair 580". Airliners.net. Retrieved July 26, 2017. ^ "Photos of Fokker F-27". Airliners.net. Retrieved July 26, 2017. ^ "Incident Report". Rimoftheworld.Net. Archived from the original on 2009-09-02. Retrieved 2010-05-28. ^ "InciWeb the Incident Information System: Oak Glen". Inciweb.org. 2009-08-30. Retrieved 2010-05-28. ^ "Like the phoenix, the SuperTanker to rise again". Fire Aviation. Retrieved 2016-11-22. ^ "10 Tanker LLC". Retrieved 19 November 2016. ^ "Operations". neptuneaviation.com. Retrieved July 26, 2017. ^ Gabbert, Bill (2 October 2012). "Air Spray moves into California, will convert the BAe 146 jet into air tanker". Wildfire Today. Retrieved 9 January 2013. ^ "Erickson Aero Tanker places its first McDonnell Douglas DC-9-87 into fire tanker operations". worldairlinenews.com. Retrieved July 26, 2017. ^ "Coulson to convert 737's into air tankers". Fire Aviation. Retrieved 2017-10-02. ^ "Coulson 737 waterbomber used for the first time". ABC News. Retrieved 2018-11-23. ^ "Infinite Possibilities of the US-2; Firefighting Amphibians". ShinMaywa. Retrieved July 26, 2017. ^ "UDSA Forest Service Specification 5100-304c Long-Term Retardant, Wildland Firefighting" (PDF). June 1, 2007. p. 2. Archived (PDF) from the original on 8 November 2008. Retrieved 2008-11-24. ^ Christopher, Ben. "Does Using Airplanes to Put out Forest Fires Actually Work?". Priceonomics. Retrieved 23 July 2016. ^ "WARBIRDS OF GLORY B-25J SANDBAR MITCHELL RECOVERY & RESTORATION". Retrieved 27 November 2013. ^ "National Transportation Safety Board Aviation Accident Final Report Accident Number: LAX94FA323". National Transportation Safety Board. December 19, 1995. Retrieved July 26, 2017. ^ "27 Deaths in Air Tanker Crashes Since 1991". KOLO-TV. Retrieved 26 July 2017. ^ "National Transportation Safety Board Aviation Accident Final Report Accident Number: LAX95GA219A". National Transportation Safety Board. June 25, 1996. Retrieved July 26, 2017. ^ "National Transportation Safety Board Aviation Accident Final Report Accident Number: LAX95GA219B". National Transportation Safety Board. June 25, 1996. Retrieved July 26, 2017. ^ "Air tanker pilots killed in B.C. crash identified". CTV News Vancouver. May 18, 2012. Retrieved July 26, 2017. ^ "Firefighting helicopter crash in Slave Lake, one fatality". wildfiretoday.com. Retrieved 25 June 2012. ^ "Pilot dies in helicopter crash near Slave Lake". cbc.ca. Retrieved 25 June 2012. ^ Whitfield, Bethany (14 June 2012). "NTSB Issues Preliminary Air Tanker Crash Report". Flying. Retrieved 26 July 2017. ^ Carver, Lt. Col. Robert (3 July 2012). "ANG announces C-130 crash victims". US Air Force. Retrieved 26 July 2017. ^ Bailey, David (2 July 2012). "Air Force C-130 crashes fighting South Dakota wildfire". Rueters. Retrieved 26 July 2017. ^ "Investigation: AO-2013-187 - In-flight breakup involving PZL Mielec M18A Dromader aircraft, VH-TZJ, 37 km west of Ulladulla, NSW on 24 October 2013". Australian Transport Safety Bureau. Retrieved 2016-11-23. ^ Welch, William M. (8 October 2014). "Pilot of crashed plane near Yosemite fire dies". USA Today. Retrieved 26 July 2017. ^ Passifiume, Bryan (2015-05-22). "Pilot dead after water bomber battling wildfire near Cold Lake crashes Friday afternoon". Calgary Sun. Retrieved 2017-07-26. ^ Gabbert, Bill. "Air tanker crashes in British Columbia lake". Fire Aviation. Retrieved 2015-10-01. Keijsper, Gerard. "Water-Bombers Required!" Air Forces Monthly, London: Key Publishing, July 2008 Issue. Marsaly, Frédéric and Prétat, Samuel. "Bombardiers d'eau Canadair Scoopers" Editions Minimonde76, May 2012, ISBN 9-782954-181806. Wikimedia Commons has media related to Aerial firefighting.